You may have to squint to see it in the graph above but the federal lease inventory controlled by GSA has declined by a little more than a million square feet over the past year. This should be no surprise because in 2012 OMB issued its “Freeze the Footprint” memorandum making it clear that the federal real estate inventory would be capped at the level established in that fiscal year. That same policy memorandum encouraged inventory reduction as well. Though the reduction we see in the graph appears quite modest (roughly one-half of one percent of the total lease inventory) it is more foreboding because the decline is occurring despite the fact that most agencies have been forced to relinquish their independent or delegated leasing authority to GSA. As an example, the SEC no longer leases space independently. As each of its 2+ MSF of leases expire they are transferred to GSA control. So, all other things being equal, we would expect GSA’s lease inventory to grow. Yet, clearly it isn’t. The lease inventory is expected to become even smaller. That’s because most procurements in the works now are programmed for less space. GSA has been slow to implement these space reductions, more often kicking the can with short-term lease extensions. Yet, new leases will eventually be executed and the downsizing will occur. Even if the government lifts the cap on federal leasing, the next tranche of executed leases will serve to reduce the inventory further. We see this trend continuing for at least the next couple of years but, if history is any guide, it should eventually reverse itself. 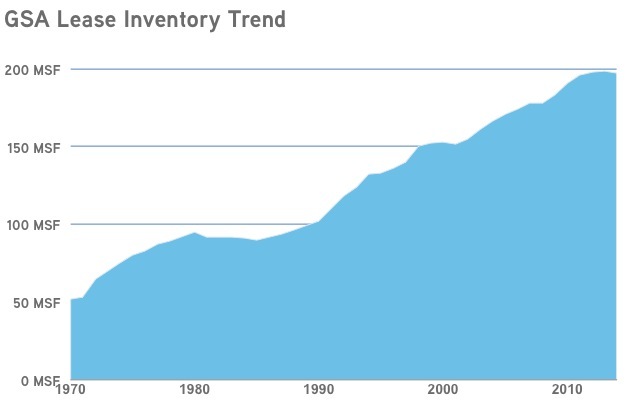 The GSA lease inventory has grown 400% since 1970.